For Chef Jeff McInnis, a meal isn't just a meal; it's an event. More than the act of chewing, a meal is about the ingredients that go into making it, the chef who is preparing it and, of course, the people who are eating it. 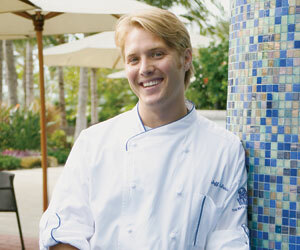 TravelsinTaste.com recently spoke at length with Chef McInnis, Chef de Cuisine of Dilido Beach Club at the Ritz Carlton South Beach, to find out not only how he defines and prepares a meal, but also to get his very interesting takes on the future evolution of cuisine and his particular style of cooking, not to mention his spectacular champagne and wine cork collection. Chef McInnis has an eye for culinary trends, and there are at least two that he says will transform the kitchens of the future. "There are two completely different ways I envision food and cuisine evolving," he says. "The fine dining industry developing newer techniques and ingredients and the more common casual restaurants keeping a health conscious approach using natural ingredients." Another popular trend that's changing not only the way that people eat, but also the way that chefs work, is fusion cooking, he adds. "Over the past few years," he says, "the 'foodies' have opened their minds to fusion-the mélange of two or more cuisines. I strongly feel this fusion is going to continue to thrive for another decade. Food will also continue to become more complex as chefs are constantly educating themselves with cutting edge techniques and new ingredients. The use of nitrous, foamers, helium, protein binders, stabilizers and thickeners will continue to revolutionize fine dining forever." Of course, so will fitness. "There is a significant amount of Americans who are more conscious of their weight and cholesterol intake than ever before," Chef McInnis observes. "More people are reading food labels in the grocery stores. I believe there will also be more demand for organic, low-fat and natural foods. New studies are constantly showing that people who ingest artificial and processed food are more likely to have cancer later in life. As a result, restaurants will continue to feature healthy items as well as a variety of vegetarian options." Trends are one thing, but style is another. The former come and go, but the latter endures. "It is difficult to put a label on a chef's style," Chef McInnis says. "However, I can explain to you why I cook the way I do. It's actually quite simple. My goal is to not just make a meal for a guest, but to create a culinary experience." How is this done? According to Chef McInnis, it's done with a keen eye for detail. "I make sure the products I use are the best quality products available," he says. "I have found that it is what the public wants, and it's exciting to me. When cooking, my style is to make sure that every piece of the dish is a part of the big picture. The food must come alive using different flavors that balance each other, making sure to never overpower or take away from another ingredient on the plate. The different textures of the dish are very important, as is the artistic presentation. People truly eat with their eyes before their mouths." Style isn't all about ingredients and presentation, though. Oftentimes, it's about hard work and dedication, too. "I never leave the kitchen until I'm satisfied with the outcome of my work," Chef McInnis says.